That was Phil Jackson speaking about forward Carmelo Anthony, just one day after it was revealed that both Jackson and the New York Knicks had exercised the mutual option for the two years remaining on Jackson’s contract as team president. The audacity with which Jackson continues to speak in public about his star player is, for many, shocking. But what he is doing, wise or not, is clearly strategic in nature. He wants to move on from Anthony. But he is also aware that Anthony holds the balance of power in that regard. Anthony has a sizable contract – it will pay him $26.2 million next season, and $27.9 million in 2018-19 if he declines to exercise his early termination option (ETO). He has a 15% trade kicker that could increase it even further. And, most importantly, he has a no-trade clause. If he wants to remain a Knick, he will. And there’s little Jackson can do to stop it. Other than make his stay in New York so unpleasant as to cause him to want to leave. Anthony, 32, is a seasoned NBA veteran. He is well aware of what Jackson has been saying, and why. He is not about to allow it to influence him to make a hasty decision. 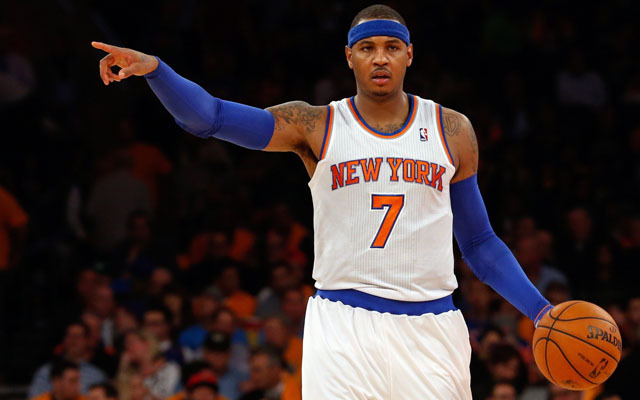 But Anthony has reportedly conceded that he would consider waiving his no-trade clause under the right circumstances. Which, in turn, could leave Jackson with an unknown list of potential trade partners, an unknown list of demands from those suitors, and with some technical difficulties that would still need to be overcome if there is to be an interest. Teams can engage in trade discussions after their seasons have ended. In the case of those which have missed the playoffs, that’s now. In the case of those which have made the playoffs, that’s after they’ve been eliminated or won the title. The Knicks figure to initiate Anthony trade discussions with potential suitors in each case as soon as is legal. But when he would be traded could be nearly as interesting as if he will be traded. A significant dividing line: July 1, 2017. That’s the date that separates the current salary cap year from the new salary cap year. It’s also the date that separates the current CBA from the new CBA as the rules under which the league operates. Among the rules that will remain the same in both CBAs: (i) the amount of Anthony’s full trade bonus, (ii) how that trade bonus would get allocated to team salary, (iii) how Anthony could leverage his ETO to impact his trade bonus, and (iv) how the trade bonus would impact team salary. Anthony’s trade bonus under both CBAs, which would be paid up front by the Knicks but increase the cap hit of the team which acquires him, would pay out up to 15% of his remaining contract: that’s $8.1 million. Trade bonuses under both CBAs would get allocated over the then-current and all future seasons remaining on a player’s contract, excluding any years following an option or ETO, in proportion to the salary which is guaranteed in those seasons. Anthony’s contract is fully guaranteed, and contains an ETO on the final season. Players whose contracts contain ETOs can agree with their teams to amend their contracts to eliminate them under both CBAs. A player eliminating his ETO is essentially him eliminating his right to opt out. Anthony isn’t about to opt out of his $27.9 million salary for 2018-19 anyway. When a team trades a player with a trade bonus, it uses the player’s pre-trade salary (without the bonus) when comparing salaries for trade. When a team trades for a player with a trade bonus, it must count the portion of the bonus that applies to team salary in that season as incoming salary. The imbalance could make it more difficult to match salaries, and potentially even trigger unforeseen luxury tax concerns for the now-completed 2016-17 season if teams aren’t careful. Anthony’s outgoing salary would be considered $24.6 million to the Knicks, while his incoming salary to a potential trade partner would be considered either $27.3 million (if he eliminates his ETO) or $28.6 million (if not). That imbalance could add minor challenges to trade structuring, but it is substantially less than the imbalance that would be created if he were traded after July 1st. More importantly, trading Anthony before July 1st would allow the trade partner to allocate a portion of the cap hit associated with his trade bonus to the already-completed 2016-17 season. Which, in turn, reflect significant potential advantages to trading him before July 1st. First, under the current CBA, players can waive a part of their trade bonuses… but only to the extent necessary to make a trade permissible within the confines of the traded player exception. That can be very limiting. Second, teams which were hard-capped this season (e.g., the Los Angeles Clippers) will remain hard-capped through June 30th. That can be very restrictive. Third, teams can’t trade players whose contracts are about expire. That can be even more restrictive. For potential Anthony trades before July 1st: Anthony can control if he is traded (because of his no-trade clause). He can control how his trade bonus is allocated to team salary (by deciding whether to eliminate his ETO or not). But he has only limited control over the amount of his trade bonus (he can only reduce it in to make a trade legal within the confines of the traded player exception). And he has no control over whether a potential trade partner is hard-capped, and no control over whether the players he might be traded for are even trade eligible. These factors create every bit the difficulty that Jackson faced in his failed attempts to shop Anthony at the trade deadline (see the original post below for a detailed breakdown). Whether or not Anthony eliminates his ETO, his contract would produce a huge cap hit for a trade partner to absorb in exchange for a 33-year-old on the downside of his career — substantially bigger than if he were traded before July 1st. It also creates an even bigger imbalance in how much Anthony’s contract would count for trade purposes – an outgoing salary of $26.2 million for the Knicks, vs. an incoming salary of either $30.3 million or $34.4 million for the trade partner. Which, in turn, reflect significant potential disadvantages to trading him after July 1st. First, when the seasons turn over, more teams will have increased cap space with which to accept imbalanced trades. Second, teams which were hard-capped this past season would have their slates wiped clean. Third, players whose contracts have expired can be included in trade discussions if they agree to be signed-and-traded — though, as an added complication, they could be subject to “base year compensation” treatment if the team trading the player is above the cap after signing him and he receives a raise greater than 20% (which would make the player’s outgoing salary for trade purposes the greater of his previous salary and 50% of his new salary, while the team receiving the player would use his new salary). Fourth, under the new CBA, players are free to waive any or all of their trade bonuses at will. For potential Anthony trades after July 1st: Anthony can control if he is traded (because of his no-trade clause). He can control the size of his trade bonus (he can reduce it all the way down to nothing, he can demand the full $8.1 million payout, or anything in between). And he can control how his trade bonus gets allocated to team salary (by deciding whether to eliminate his ETO or not). When a potential trade of Anthony would be completed would depend upon the circumstances surrounding it. Of course, that presupposes a trade could be found. Finding a trade partner for Anthony won’t be easy. Finding a trade scenario acceptable to Jackson and the Knicks could prove harder still. Finding one acceptable to both Jackson AND Anthony could prove nearly impossible. Anthony certainly doesn’t need to relent. His current situation would appear imminently acceptable to him – living in New York, playing for the Knicks. The Knicks initially reached out to three teams at the trade deadline to whom it believed Anthony would agree to be traded, to gauge potential trade interest: the Cleveland Cavaliers, Los Angeles Clippers and Boston Celtics. For potential trades prior to July 1st, there remains no realistic way to structure a two-team deal in which the hard-capped Clippers do not cross the hard cap without Anthony also earning his full trade bonus (for all the reasons described below). That means his salary would be $27.3 million if he eliminates his ETO and $28.6 million if not, which in turn means they would need to send out at least $24.7 million in salary to stay below the hard cap if Anthony eliminates his ETO and at least $26.1 million if not. There simply isn’t a realistic grouping of players eligible to be traded (which excludes all pending Clippers free agents) that earn that much. For potential trades after July 1st, things get easier but still remain complicated. Any Clippers free agent would need to consent to be included in a potential Anthony trade as a sign-and-trade candidate. The Clippers would need to deal with “base year compensation” issues for any of its signed-and-traded players who receive a raise of more than 20% (a list which will include, among others, Blake Griffin). If Griffin were included, the Knicks would be barred from re-signing Derrick Rose (because NBA teams can only have one player at a time who was acquired in trade and is playing under a designated rookie-scale extension signed with another team). And, of course, Anthony would need to agree to be traded to a team in the substantially more difficult Western Conference who has just sacrificed the players the Clippers will have agreed to trade to make the deal happen. Which begs the question: What happens if a trade acceptable to both Jackson AND Anthony can’t be worked out? The more appealing a potential trade would be for Jackson and the Knicks, the less appealing it might be for the team to which Anthony would be traded. Anthony allowing for the possibility of a trade doesn’t mean he can’t force Jackson to accept a bad one. Would he, if that’s what it took to get rid of Anthony? Or would Jackson ultimately refuse to put the Knicks’ long-term flexibility at risk just to be rid of the man of whom he clearly no longer wants any part? And if he does refuse, or if a trade can’t be found, then what? Would he allow Anthony to play for the Knicks for yet another season? Or has the situation already escalated to the point of no return? Would he retain Anthony on the roster but refuse to play him? Or would the resulting firestorm in the nation’s most vocal city, coupled with the prospect of a surefire protest by the players association, be too much to endure? Would he waive Anthony? Or would the prospect of massive dead-money cap hits – Jackson’s choice between $26.3 million for 2017-18 and $27.9 million for 2018-19, or a stretched $10.8 million for each of the next five seasons – if he’s not claimed off waivers be too much to endure? Jackson has made the situation uncomfortable. Anthony can hit right back – effectively forcing Jackson to trade him on his terms or, if Jackson truly wants him gone, to waive him. The future of star Carmelo Anthony with the New York Knicks has become a daily source of intrigue. There has been widespread speculation that team president Phil Jackson and perhaps others within the organization want to trade him, and rebuild around second-year big man Kristaps Porzingis. Trade scenarios, however, are exceedingly complicated for a multitude of reasons. The most obvious: Anthony has a no-trade clause. Which essentially means he can refuse to be traded, or pick his destination if he were to agree. According to Marc Stein and Chris Haynes of ESPN, Anthony has said he “would have to consider” waiving his no-trade clause if the Knicks ultimately decided to go in a different direction. But, even then, it won’t be easy. Anthony, 32, is making $24.6 million this season. He’ll make another $26.2 million next season, and $27.9 million in 2018-19 if he chooses not to exercise his early termination option (ETO). His contract also contains a 15% trade kicker, which could pay out more than $9 million if he is dealt and can only be reduced in limited circumstances. The Knicks have reached out to three teams to gauge potential trade interest: the Cleveland Cavaliers, Los Angeles Clippers and Boston Celtics. To the Cavaliers, the Knicks reportedly attempted to engage in discussions around a swap of Anthony for Kevin Love. They were quickly rejected. It’s not hard to see why. Last year, the Cavaliers, Knicks and Celtics reportedly discussed a three-team deal that would send Love to Boston, Anthony to Cleveland and likely Jae Crowder and others to New York. Those rumors were prompted by Love’s inability to find a role that maximized his skill-set within the Cavaliers offense. But after the role Love played in helping the Cavaliers win their first championship in franchise history last June, things have changed considerably. He’s now an All-Star this season, and a key piece of the team’s core. And even if Cleveland were to get on board strategically, the trade would be difficult financially. Love is earning $21.2 million this season, and has three additional seasons on his contract at $22.6 million, $24.1 million and $25.6 million, respectively. The final season, 2019-20, is at Love’s option. That’s a substantially smaller per season payout than for Anthony, which would be magnified in a potential trade scenario both by Anthony’s trade bonus and Cleveland’s excessive payroll. Swapping Love for Anthony prior to the Feb. 23 trade deadline would replace Love’s $21.2 million salary for this season with Anthony’s $24.6 million salary, a $3.4 million difference. Since both Anthony and Love will have already been paid more than 70% of their salaries at the Feb. 23 trade deadline, Cleveland would be responsible for only an incremental $958K this season. Cleveland would also be response for the full $3.6 million extra next season, and the full $3.8 million extra for 2018-19. Then there’s Anthony’s trade bonus to consider: With $61.3 million still to be paid on his contract at the Feb. 23 trade deadline, 15% of that would equal $9.2 million. The collective bargaining agreement allows a player to waive part of his trade bonus, but only if it necessary to make a trade permissible for the receiving team within the confines of the traded player exception. So it could be lower, but only in limited circumstances. Per the rules of the traded player exception, the very least the Cavaliers would need to trade away in exchange for Love salary would be: His outgoing salary *1.25 + $100K. Since Love makes $21.2 million, that’s $26.6 million. Anthony’s base salary is $24.6 million. With his full trade bonus, his salary would increase to $27.3 million (if he eliminates his ETO) or $29.2 million (if not). But since a Love-for-Anthony swap would only be legal if Anthony made no more than $26.6 million, Anthony could agree to reduce his trade bonus to make his salary $26.6 million (which is higher than his base salary but lower than his base salary plus his full trade bonus). If his base salary is $24.6 million and his total cap hit could only be $26.6 million, then his trade bonus allocation for this season could be no higher than $2.0 million. If he eliminates his ETO, he could have that $2.0 million bonus allocation applied to the next three seasons; that’s a total trade bonus of $6.0 million (a $3.2 million reduction). If he doesn’t eliminate his ETO, he could have that $2.0 million bonus allocation applied only to the next two seasons; that’s a total trade bonus of $4.0 million (a $5.2 million reduction). That, in turn, makes clear a subtle but powerful conclusion: If a potential trade would require Anthony to reduce his trade bonus, he’ll want to eliminate his ETO in order to maximize his trade bonus payout. In the hypothetical example above, Anthony has increased his trade bonus from $4.0 million to $6.0 million by eliminating his ETO! So… how costly would a Love-for-Melo trade be? Cleveland’s salary payouts would increase by $958K for 2016-17, by $3.6 million for 2017-18, and by $3.8 million for 2018-19. That’s $8.4 million total. For 2016-17: The Cavaliers are currently committed to $128.0 million in salaries and $27.1 million in luxury taxes for this season. That’s an NBA-high $155.2 million total. And if Cleveland were to add any salary, it would cost them that new salary plus an additional $2.50 to $3.25 per dollar in taxes per every additional cap hit dollar added. His $26.6 million cap hit would be a $5.4 million increase over what the Cavaliers had with Love. That’s an additional $17.0 million in taxes for this season alone. For 2017-18: Repeater tax consequences — which are triggered if a team is paying the tax for a fourth time in five years, and require taxpaying teams to add an additional $1.00 for every dollar by which they are over the tax line — would start to kick in, when Anthony’s cap hit would increase to $28.2 million, a $5.6 million increase over what the Cavaliers had with Love. It’s not all that difficult to project the corresponding luxury tax consequences to reach or exceed $20 million. For 2018-19: The repeater tax consequences would depend on whether Anthony chose to eliminate his ETO or not. His cap hit would remain at $27.9 million if not, and increase to $29.9 million if so. That’s an incremental $3.8 million and $5.8 million, respectively, over what the Cavaliers had with Love. It’s not all that difficult to project the corresponding luxury tax consequences to reach or exceed $13 million and $20 million, respectively. For 2016-17, $958K of incremental salary and $17.0 million of incremental luxury taxes; that’s $18.0 million total! For 2017-18, $3.6 million of incremental salary and maybe as much as, or more than, $20 million of incremental luxury taxes; that’s $24 million total! For 2018-19, $3.8 million of incremental salary and maybe as much as, or more than, $13 million – $20 million of incremental luxury taxes; that’s $17 million – $24 million total! Over the next three years combined, that’s $8.4 million in incremental salaries and perhaps $50 million – $57 million in incremental luxury taxes; that’s about $60 million to $67 million total! Even if Love for Anthony were to make strategic sense for the Cavaliers, certainly the prospect of adding $60 million-plus in payroll expenses over this and the next two seasons might give Cleveland huge pause from a financial perspective. The Knicks could, of course, lessen the blow by throwing cash and/or adding players into the deal. Given that Anthony’s trade bonus would increase by 25% more than the amount of any additional salaries Cleveland would throw into the deal (effectively making it more costly, not less), any additional salary that the Knicks would take on would need to be structured as a completely separate side deal. Such a side deal, depending upon who it would involve, could provide the Cavaliers some relief. But any which way you structure it, the Cavaliers would be talking about adding substantial additional salary. That’s a big bet, on a soon-to-be 33-year-old. Particularly in exchange for an All-Star in the prime of his career rather than, say, a couple of high-priced complementary pieces. Which is why the Cavaliers reportedly have an interest in Anthony, but not if it means parting with Love. But what else is left that would interest the Knicks? To the Clippers, the Knicks have reportedly made some traction. Los Angeles has made it known that it will not trade any of its Big Three of Chris Paul, Blake Griffin and DeAndre Jordan in any potential Anthony deal. Griffin, by rule, can’t be traded to the Knicks while Derrick Rose remains on New York’s roster anyway. Teams can only have one player signed to a designated rookie-scale extension on their roster that was acquired in trade at any given time. Rose and Griffin both signed such extensions. This rule will not be changing in the new collective bargaining agreement either. But none of that has caused the Knicks to shy away. According to Frank Isola of the New York Daily News, the Knicks and Clippers have engaged in discussions. The Clippers are reportedly willing to part with Austin Rivers, son of head coach Doc Rivers, rumored to be of primary interest to the Knicks, who are reportedly reluctant to absorb the two years and $28.7 million (of which $17.2 million is guaranteed) remaining on the contract of Jamal Crawford after this season. Yet, despite both teams’ willingness to work around all those restrictions, a potential deal would still be hugely complicated – so much so, in fact, that it would virtually require the involvement of a third team to facilitate. To understand why requires an understanding of intricate salary cap rules. Anthony makes $24.6 million. Per the rules of the traded player exception, the least the Clippers would be able to trade away in exchange for a salary that large would be: (Incoming Salary – $100,000) / 125% = $19.6 million. On the surface of things, that’s easy enough: Rivers ($11.0 million) and, for example, J.J. Redick ($7.4 million, who has a 5% trade bonus of his own, which would not impact the Clippers’ outgoing salary calculation) and prospect Brice Johnson ($1.3 million); that’s $19.7 million – just one combination of many that gets you there. First, Anthony has that 15% trade bonus that can only be reduced in limited circumstances. Second, the Clippers are dealing with a hard cap on spending at $117.3 million. The current collective bargaining agreement contains a new rule, the implementation of an “apron” that is slotted $4 million above the tax line. Teams are prohibited from exceeding the apron if they engage in certain transactions. On that list: using the full midlevel exception, using the bi-annual exception, and accepting another team’s free agent by means of a sign-and-trade. The apron is a brick wall on spending, one that cannot be crossed for any reason. A team cannot exceed it even for a moment, and even if it were to subsequently drop back down below it. Merely approach it, and it becomes harder to make trades that bring in more salary than they send out, or even sign minimum-salary players when injuries strike. It is a constant menace floating in the distance. By signing Wesley Johnson to a full midlevel exception deal this summer, the Clippers became hard-capped at the $117.3 million apron. With its team salary currently at $114.7 million, they have just $2.5 million of room below it with which to maneuver. These two rules are seemingly innocuous individually, but put them together and they produce very powerful, and limiting, results. Let’s go back to our original trade to see why: Anthony ($24.6 million) in exchange for Rivers ($11.0 million), J.J. Redick ($7.4 million) and prospect Brice Johnson ($1.3 million). The $19.7 million in outgoing salary would not be enough to account for Anthony’s $24.6 million salary AND his full trade bonus allocation (which, as noted above, would be either $3.1 million or $4.6 million depending on whether he eliminates his ETO or not) within the confines of the traded player exception. But, as noted above, Anthony would be allowed to reduce his trade bonus in such circumstances. In fact, almost the entire trade bonus would need to be eliminated to comply with the terms of the traded player exception. This has the added benefit of not requiring the Knicks to pay, and the Clippers to suffer the cap hit, for it! In this scenario, all but $210K of Anthony’s trade bonus would be eliminated, of which half would be applied to this season. Anthony’s new total salary for this season: $24.7 million. So… the Clippers would be sending out $19.7 million and taking in $24.7 million – a trade that satisfies the terms of the traded player exception, even after accounting for Anthony’s trade bonus. Done! The Clippers can’t take in $24.7 million and send out just $19.7 million. That’s a $5.0 million difference. They were only $2.5 million below the hard cap. They’d blow right past it! The lesson learned: A trade bonus can be amended to make a trade legal within the confines of the traded player exception, but not to make a trade legal within the confines of the hard cap. So let’s modify our original trade to accommodate this change. The Clippers would need to add at least $2.5 million in salary to the deal (more when you consider that trading four players for one would drop L.A. down to 12 players, below the 13 player minimum, necessitating that they add salary). Say, for example, Paul Pierce. He makes $3.5 million. That’s enough for L.A. to remain below the hard cap, with about $1.0 million to spare. That’s plenty. We’ve now modified our original trade to: Anthony ($24.6 million) in exchange for Rivers ($11.0 million), J.J. Redick ($7.4 million), prospect Brice Johnson ($1.3 million) and Paul Pierce ($3.5 million); that’s $23.2 million. It is important here to view a trade from each team’s perspective separately, rather than as a single, unified transaction. This is because the same trade may be organized differently according to each team’s needs. And each team can have more than one structural option from which to choose. We know that, from L.A.’s perspective, a trade of Anthony for Rivers, Redick and Johnson is both legal for purposes of the traded player exception and has the added benefit of eliminating virtually the entire Anthony trade bonus. So let’s break the overall trade in two sub-trades for purposes of optimal structuring: that one, and a trade of Pierce in exchange for nothing. So… the Clippers have structured the primary portion of the trade to satisfy the terms of the traded player exception, and the secondary portion of the trade to keep the Clippers below the hard cap. Done! Here’s where things start to get tricky: The collective bargaining agreement allows a player to waive part of his trade bonus, but only if it necessary to make a trade permissible for the receiving team within the confines of the traded player exception. But this very same trade would be perfectly legal within the confines of the traded player exception with only a tiny reduction, if any at all, of Anthony’s trade bonus if the trade were instead structured, from L.A.’s perspective, as one master trade rather than two sub-trades. By doing so, the traded player exception would allow the Clippers to take in as much as $29.1 million in salary (which is equal to the $23.2 million in outgoing salary x 1.25 + $100K). Anthony’s cap hit would therefore become $27.6 million (his $24.6 million base salary plus his full $3.1 million trade bonus allocation) if he were to eliminate his ETO (and he’d get his entire $9.2 million trade bonus), and $29.1 million (his $24.6 million base salary plus a $4.5 million trade bonus allocation) if not (and he’d get $9.0 million of his $9.2 million trade bonus). And if the Clippers take on either $27.6 million or $29.1 million, while trading away just $23.2 million, they’d be adding either $4.4 million or $5.9 million in salary. In either case, they’d blow past the hard cap! The lesson learned: A trade bonus can be amended to make a trade legal within the confines of the traded player exception, but if the trade can already be legal within the confines of the traded player exception by utilizing a different structure, a trade bonus can’t be amended in order to choose a more beneficial structure(1). In fact, there is no realistic way to structure a two-team trade in which the Clippers do not cross the hard cap without Anthony also earning his full trade bonus. That means his salary would be $27.6 million if he eliminates his ETO and $29.2 million if not. First, they would need to endure the elevated cap hits — either $27.6 million or $29.2 million (depending upon whether he eliminates his ETO) for 2016-17; either $29.3 million or $30.8 million for 2017-18; and either $31.0 million or $27.9 million for 2018-19. Second, they would need to send out at least $25.1 million in salary to stay below the hard cap if Anthony eliminates his ETO, or at least $26.6 million if not. Even if the first problem were manageable, the second is nearly impossible. With the Clippers unwilling to trade Paul, Jordan or Griffin and the Knicks unwilling to take on Crawford, there is no realistic combination of players that gets you there. Which makes a single, two-team trade between the Knicks and Clippers virtually impossible! But what if you break the trade down into two completely separate trades? The reason the Anthony ($24.6 million) in exchange for Rivers ($11.0 million), J.J. Redick ($7.4 million), prospect Brice Johnson ($1.3 million) and Paul Pierce ($3.5 million) trade was illegal was because, while the optimal structure would be legal, it could be structured in a way that would make it illegal (by forcing Anthony to take on his entire trade bonus and thus pushing the Clippers over the hard cap). What if we removed that possibility by structuring two complete separate trades — Pierce for nothing first, and then Anthony for Rivers, Redick and Johnson? It’s legal! It works for the Clippers! Done! It doesn’t work for the Knicks. They don’t currently have a trade exception. They have no means to take in Pierce without sending back roughly equivalent salary in return. Which accomplishes nothing for the Clippers. Which makes a combination of trades between the Knicks and Clippers almost impossible! So why are Knicks and Clippers seeking a third-team facilitator to keep alive the prospect of completing an Anthony trade? Given the constraints of both parties, it’s simply not possible to get it done otherwise. What is needed from a third party to move talks forward? At the very least, a team willing to take on some salary from L.A. in order to help them avoid crossing the hard cap. Perhaps it’s Crawford, which could allow the Clippers to retain Redick, which they’s surely like to do. At a minimum, it figures to be the contract of Paul Pierce, which has a $3.5 million salary for this season and a $3.7 million salary for next season which is only $1.1 million partially guaranteed. Get that, and the original Clippers portion of the trade works perfectly: Anthony for Rivers, Redick and Johnson. Could the Clippers and Knicks find such a team? Perhaps a team below the salary floor — Brooklyn Nets, Denver Nuggets, Minnesota Timberwolves, Philadelphia 76ers, Phoenix Suns and Utah Jazz — would take interest as a means to save themselves some money. Perhaps, given the financial savings, they wouldn’t require all that much in return. If not, the Knicks would not face similar challenges next season. The new collective bargaining agreement to come allows a player whose contract contains a trade bonus to reduce or eliminate it at his discretion. The problems will therefore solve themselves. A trade of Anthony to the Celtics would be far less complicated than to the Cavaliers or Clippers. With Boston currently $1.1 million below the salary cap, there are no luxury tax consequences to contemplate. No hard cap issues. No worries about the trade bonus, which could be accommodated. The Celtics would simply need to send out $19.6 million or more (the closer to that figure, the lesser the trade bonus) in exchange for Anthony. Nothing is easy when it comes to the Carmelo Anthony saga. Anthony, for his part, has said that he wants to remain in New York. It is unclear as to whether he would even accept a trade, and the list of teams to whom he would if so. How it all plays out, only time will tell. (1) This is based on my interpretation of the cap rules. It has not been verified with the league office as of yet. I will try to verify it shortly. In the meantime, if it helps you to determine for yourselves, the actual language reads as follows: “For the sole purpose of enabling an assignee Team to acquire a Player Contract by trade, the player and the assignor Team may agree to waive all or any portion of a trade bonus, but only to the extent necessary to make the trade permissible in accordance with the rules set forth in Section 6(j) above.” Section 6(j) refers to the Traded Player Exception.